Academy Award® winner Juliette Binoche (Best Actress in a Supporting Role, The English Patient, 1996) and Academy Award® nominee Clive Owen (Best Performance by an Actor in a Supporting Role, Closer, 2004) deliver “a great Hepburn/Tracy rapport” (Entertainment Weekly) in “one of the best films of the year,” (NPR) Words and Pictures. This nationwide theatrical release about an unlikely romance between two rivals arrives on Blu-ray Disc (plus Digital HD) DVD (plus Digital), Digital HD and Video on Demand September 9 from Lionsgate Home Entertainment. Featuring an audio commentary with the director and a behind-the-scenes featurette, Words and Pictures will be available on Blu-ray and DVD for the suggested retail price of $24.99 and $19.98, respectively. 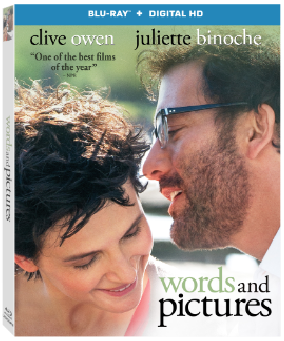 Prep school English teacher Jack Marcus (Owen) meets his match in Dina Delsanto (Binoche) – an abstract painter, and new teacher on campus – and challenges her to a war between words and pictures…and, in the process, sparks an unlikely romance. Bruce Davison Punisher: War Zone, John Q. Title Copyright: Words and Pictures © 2013 Latitude/Lascaux Words and Pictures, L.P.
INSP TO COMMEMORATE THE LIFE OF ICONIC ACTOR, RALPH WAITE, WITH “THE WALTONS” MARATHON ON SUNDAY, JUNE 22 FROM 2 P.M. – 8 P.M.